Sequim Girls 8th in State !! In an amazing season, Sequim’s volleyball team placed higher than they have in years, dominating league and journeying to the state tournament. 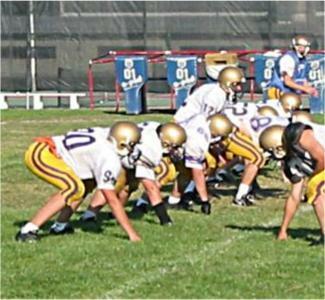 Various factors led to Sequim’s success. With a wealth of seniors, the team had much experience and camaraderie. 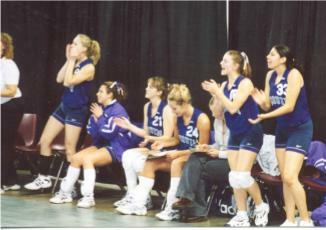 Assistant Coach Becky Balkan stated that, “Play in the off-season, positive team chemistry, and dedicated fans all combined together to deliver a great season for Sequim.” Seniors Sarah Cook, Jen Ruiz, and Chelsea Pettibone all agreed that “The fact that all the members of the team played together on the court was a positive thing. We worked hard and trusted each other to play our positions.” So, what exactly did this team accomplish? 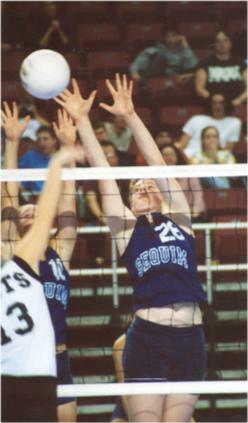 The season began similar to years past in the Nisqually League, Sequim regulating over the competition. Taking the Nisqually League Championship, Sequim headed off to Districts with an eighth place seed. However, the team proved that they were a force to be reckoned with when they placed third at Districts. Defeating Highline, Fife, and Kennedy for third place, Sequim secured a berth to the state tournament at the Yakima Sundome. 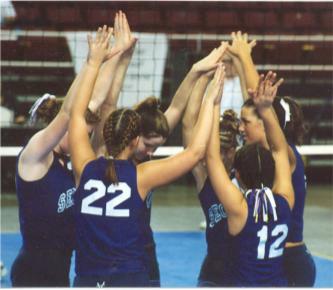 The 3A State Tournament involved the top sixteen 3A teams in the state. In an unprecedented team effort, Sequim placed second during pool play, allowing them to enter tournament play the next day. In an intense game versus Bishop Blanchet, Sequim came from behind, closing a ten point deficit and winning the first game of the match in bracket play. Unfortunately, they could not quite capitalize on their momentum and lost the second game 16-14 and the final game to end the match. The next day Sequim faced Mark Morris, losing, only to face Selah, the hometown favorite. The game with Selah served as the final game for the nine seniors’ high school careers. Sequim won the first game only to lack the final momentum to earn game point in the second game as Selah went on to win the match. Despite a disappointing loss, Sequim secured themselves eighth place in the state out of over seventy teams. Not only did this team accomplish a top eight finish, something that has not happened the twelve years that head coach Jennie Webber has coached, but also earned the distinction of academic state champions with an accumulative GPA of 3.8. The end of the season could not have had a much sweeter outcome. This team of girls showed dedication in achieving their goals while creating numerous memories. With the support of wonderful fans, this season serves as one for the record books.